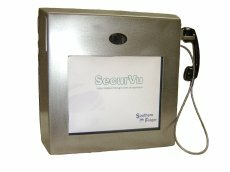 SecurVu Video Visitation provides a robust IP-based solution custom designed for the harsh correctional environment. Facilities of any size and security level can efficiently schedule, manage, monitor and record visitations. Easily links facilities to remote or onsite Visitor Centers. Increases facility security by reducing contraband exchange, conflicts between visitors and overcrowded waiting areas. Reduces operational costs by streamlining the entire visitation process and reducing inmate movement. Intuitive and easy to operate. Interchangeable, non-proprietary components. Call us today for more information.